This was eXternal’s third Listener, following on from Hellside in 2014 (the old lady swallowing a fly) and Following the Brief in 2015 (Cicero’s signs preceding events). Here we had some misprints in definitions with the correct letters in the acrosses and downs spelling out the names of a husband and wife respectively. Six answers underwent thematic modicfication — and we were actually told which entries they were! 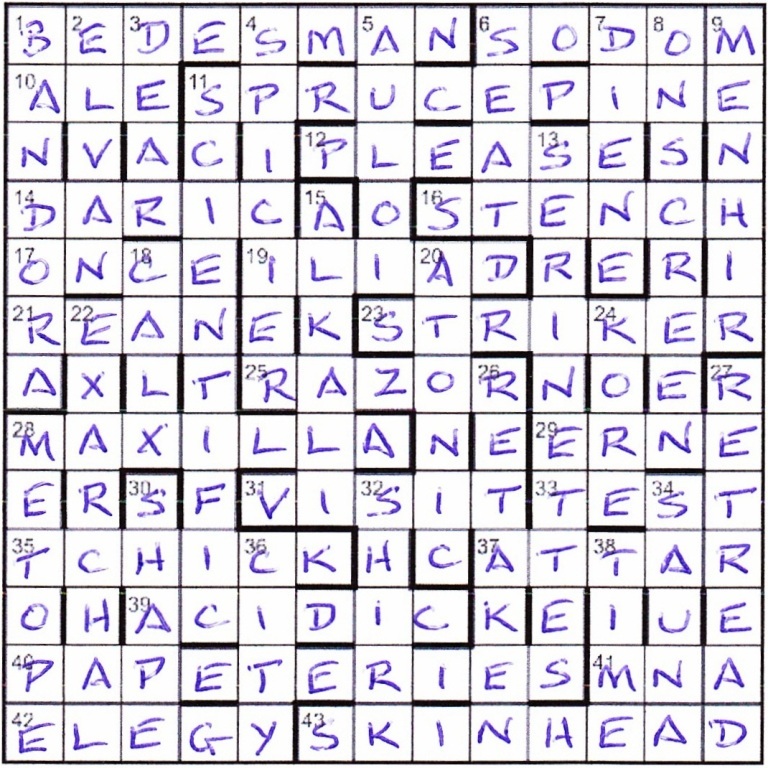 Two further thematic modifications would be required in the final grid, and all eight modified words were defined by extra words in other clues. It seemed we were being helped far more than normal here. 1ac Predict Japanese celebrity from the East becomes poet (8) was good old John BETJEMAN, and 6 Seriously foxy, extravagant robe splits (7) was SOBERLY (and I could hear a chorus of disappointment from Shirley that eXternal seemed to be TT). Now, 6ac was thematic and needed to be modified to fit a 5-letter entry. Despite having 1ac and a possible 6ac, I decided to continue with the across clues. Well that proved disappointing with only another eight slotted in, none of them being the other two thematic ones, 28 or 40. I’m sure that I’d have got 21ac Ditch silver in Nancy, perhaps, ditch [stationery cases] in Somerset (4), even if Nancy Reagan hadn’t been in the obituaries two weeks before, and despite “Nancy” these days tending to indicate a French word. A dozen down clues came next, including 20 APYRETIC and 34 SAXONY which would need thematic conversion. What’s more, I now had 5ac as S•DO•, and the “infamous Biblical city” (from 42ac) got written in. So it looked as though an anagram of DOOM, MOOD, DOM or MOD replaced OBERLY or BERLY. Big deal! More solving, and 40ac PAGEANTRIES looked like it became PAPETERIES, the “stationery cases” of 21ac. So we had the boys’ names PETE and DOM appearing in the across entries of the grid. Perhaps girls would appear in the down entries. I could see UNA in 34dn (SAUNA), but the others would have to wait. Meanwhile, a major distraction was taking place with the correct letters of misprints in the acrosses. I had …E…C…L…I… and consequently spent a lot of time trying to find out who Euclid’s wife was. This was a doomed endeavour since, according to one site, “Nothing whatsoever is known of Euclid’s personal life”! Eventually, the corrections would spell out DEUCALION and PYRRHA, the husband and wife in one of the many myths of the Flood, after which they threw rocks over their shoulders which became people: Deucalion’s became men; Pyrrha’s became women. DOM, MAX and PETE were the men, with DORA, TONI and UNA the women. All that was left was to see BETJEMAN become BEDESMAN (the “prayer” in 19ac) and SALOPETTES become SERINETTES (5dn’s “barrel organs”). And of course, BETJEMAN had JET* becoming DES for BEDESMAN, and SALOPETTES had OPAL* becoming ERIN for SERINETTES. Thus the stones and rocks that Deucalion and Pyrrha threw over their shoulders became the new men and women of the grid. The solve was just over two hours for me and very enjoyable it was, especially the final PDM. Many thanks to eXternal for a fine puzzle. This entry was posted on 8 April 2016 at 4:00 pm	and is filed under Solving Blogs. You can follow any responses to this entry through the RSS 2.0 feed. You can leave a response, or trackback from your own site.